Slide Screw | Products Lineup | Products | NIPPON BEARING CO., LTD. The NB SLIDE SCREW can be used as a transport device in many types of machines, whose application is not intended for accurate positioning requirements. The NB SLIDE SCREW converts rotational motion into linear motion by utilizing the friction between radial ball bearings and a shaft. This simple mechanism eases maintenance and installation work. The NB SLIDE SCREW consists of two aluminum blocks, each with three radial bearings with a fixed angle between them. A round shaft is inserted between the two blocks, and its rotation produces linear motion determined by the contact angle between the shaft and the bearings. For variable loads, the thrust is adjusted by turning the spring loaded thrust adjustment bolts. 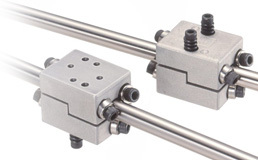 The NB SLIDE SCREW is suitable for long-stroke applications using a standard linear shaft. The bearings are pre-lubricated with grease prior to shipment, so there is no need to apply lubrication other than to the drive shaft to prevent corrosion. The NB SLIDE SCREW utilizes the rotational motion of the bearings and drive shaft to achieve machine efficiency as high as 90%. When an excessive load is applied, the screw will stop due to slippage, thereby preventing accidents.